You’ve been on quite a journey since your time with Picture Hooks in 2012. What was the first thing you did to get the ball rolling at the end of the mentoring scheme? I think I just kept drawing, developing my picture book ideas, showing it to people and then drawing even more. It has been a very busy few years! What has been your favourite project to work on since finishing with Picture Hooks? It is quite difficult to decide as every project was different and I really like them all for different reasons. I loved working on two picture books for a Polish independent publisher Dwie Siostry as I had the opportunity to work with fantastic, very powerful texts by Ewa Madeyska. The brief was very open so I had a lot of freedom with deciding what to illustrate and what the spreads would look like. I also very much enjoyed working on ‘The Fourth Bonniest Baby in Dundee’ for Floris Books. The story written by Michelle Sloan is probably the liveliest and the most hilarious thing I have ever illustrated. And of course working on my own picture book where I was both author and illustrator was a fantastic and very different experience. Whilst you were with Picture Hooks you were also Artist in Residence at the Edinburgh College of Art. What do you think was the most valuable part of that experience? Illustrating is a great job but it can feel very lonely and isolating at times – you basically spend most of your day by yourself in the studio, surrounded by your imaginary characters. It is not long before you start having conversations with them, they become your best friends etc. The residency at Edinburgh College of Art was a way to be a part of a wider community of artists and illustrators and be around people who have similar interests and understand what it is like to be a freelance illustrator. It was also great to be back to the college and get the opportunity to work with the students. I have actually never left the college after the residency as it directly lead to my job as a tutor. Now that you tutor at the University of Edinburgh, what is the most important piece of advice that you give your students? Keep a sketchbook, go out and draw from observation. This is something I find myself repeating most often. Very often students don’t appreciate how much research goes into an illustration project and how important it is to draw from observation. Keep a sketchbook, go out and draw from observation. Funnily enough, this is something I have to often repeat to myself. Sometimes I get stuck on the project, nothing really works and I feel like I will never be able to draw again. This is when I have to remind myself of that ‘most important piece of advice’ and just go out and draw. Usually an afternoon drawing in the National Museum of Scotland does the job. Drawing from observation is such an important tool for an illustrator and also a very relaxing and therapeutic thing to do. You’ve also been running creative workshops for children. Does working with young people ever feed back into your own art? Yes, definitely! All the time! It is an invaluable experience to work with children, watch them play, make art and engage with the world around them. And also seeing how different they are in the way they play or respond to the art activities – some children would spend the whole session focused, i.e. covering a large sheet of paper with glue and sticking bits of paper to it, others are much more active and they just keep running around and causing chaos. It is always a challenge to design the activities so every child can find something for themselves. And I guess when making picture books you come across similar challenges – how to make a book that appeals to a wider audience? I cannot really draw when I lead the workshops but I often take mental notes and quickly draw them from memory in my sketchbook after the session. And later they often make way into my illustrations. I am also very much inspired by the art and drawings made by small kids. I am also very much inspired by the art and drawings made by small kids. They are brilliant! When a 5 year old draws a dragon, they really mean it, they just go for it and it really comes across in the finished piece. It is a real dragon! There is this freshness and sincerity in the way children draw. And sadly it is later lost and for a grown up artist, it takes years of training and practice to somehow regain it. So yes, working with young people is an integral part of my own process and I don’t think I would be able to make picture books if I didn’t do workshops. 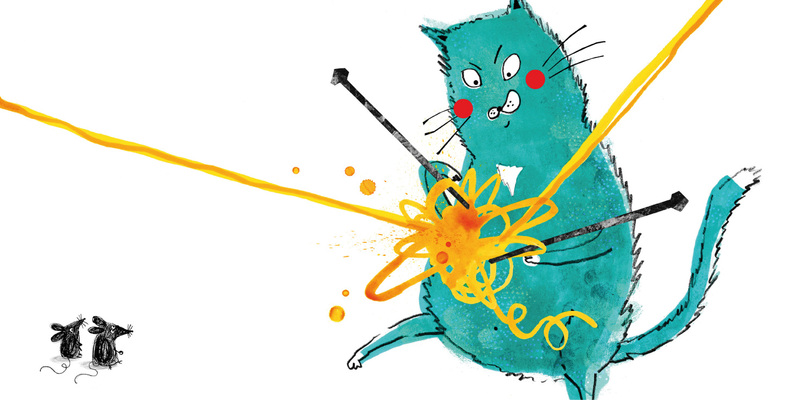 Most excitingly, you’ve got a new book coming out – called I Am a Very Clever Cat – on September 8th! Could you tell us a little bit about the book and where you got the inspiration from? Yes, this is very exciting indeed! 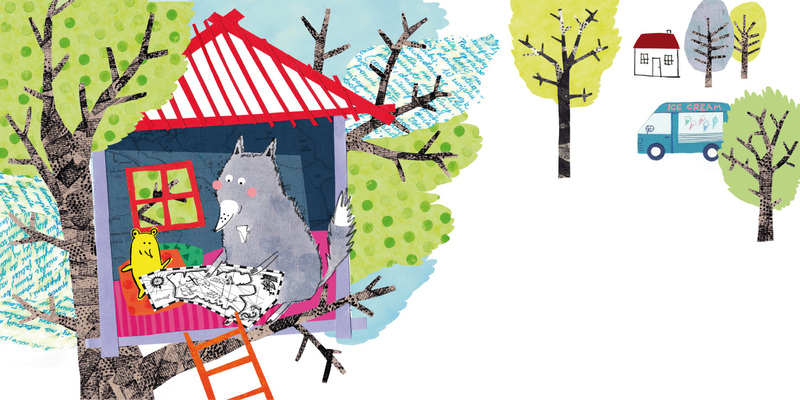 The process behind I Am a Very Clever Cat is very much connected to the Picture Hooks and it probably wouldn’t happen if it wasn’t for the mentoring scheme. It started back in 2012 with a small sketch of a cat carrying a ball of wool that I later developed into a set of illustrations and submitted for the Picture Hooks mentoring scheme. Obviously I was over the moon when I heard that my application was successful and I was one of five finalists for the first edition of Picture Hooks. During the mentoring scheme I developed the character further but I struggled a bit with a narrative. I had a character which I liked a lot, and which got a very good response from the Picture Hooks exhibition, but no story. The process behind I Am a Very Clever Cat is very much connected to the Picture Hooks and it probably wouldn’t happen if it wasn’t for the mentoring scheme. The breakthrough came later and it was inspired by two seemingly random events. One was a workshop for children I lead at the North Edinburgh Arts centre, which involved making structures from the wool. I bought three balls of wool and we made this big structure by spreading and taping the wool to the walls, floor and ceiling. It looked very tidy to start with… And then the kids came and they started playing with it, throwing the leftover balls of wool, attaching random objects to it, running around and getting caught in the net. So by the end of the session we had this big knot of wool hanging in the middle of the room with bits of furniture and art materials attached to it. A big mess! This workshop was the main inspiration for the storyline. And the other inspiration was a puppy we got around the same time. I worked from home and spent a lot of time observing him play and mostly cause chaos and destruction in our flat. And now, over four years later from that first sketch, after lots of very helpful editing advice from my agents at Fraser Ross and an awesome experience of working with the team at Templar Publishing, I am a Very Clever Cat is finally published! And finally, who was your favourite illustrator as a child? I don’t think I had a favourite illustrator as a child. There were just books I liked or I didn’t like. And one book I liked a lot was a collection of poems by Jan Brzechwa beautifully illustrated by Franciszka Themerson. It was not until later when I learnt about Franciszka and Stefan Themerson and their amazing artwork. Kasia Matyjaszek’s book I Am A Very Clever Cat will be published by Templar Publishing on 8th September 2016. Click here to buy a copy.